How Much Can I Borrow Against Cash Value? Cash value borrowing is a living benefit of whole life insurance. Cash value is a feature unique to whole life, one of the three varieties of permanent life insurance. Whole life insurance is attractive to many because it provides both death and living benefits; death benefits for your family and cash value that increases as the policy ages, for you. Although some policies allow you to simply withdraw cash value and reduce the death benefit amount, most require you to borrow against it. As long as you pay back the loan during your lifetime, borrowing against cash value will not affect the death benefit your family will receive when you pass. Monthly premium payments in a whole life policy change over time. During the first 10 to 15 years you pay more -- meaning that you are technically overpaying -- and then as you begin to age, premium amounts start to decline. This methodology is what creates cash value and keeps premium payments affordable as your age-related risk level increases. In the event you should cancel the policy during these early years, your insurance company protects itself by setting a surrender charge that in effect means assessing policy-related charges such as sales commissions upfront. The true cash value of your policy -- also called the surrender value or loan value -- is the difference between the cash value and the surrender charge. Cash value accrues interest and grows over time according to the amount you pay each month and the rate of interest your policy pays. 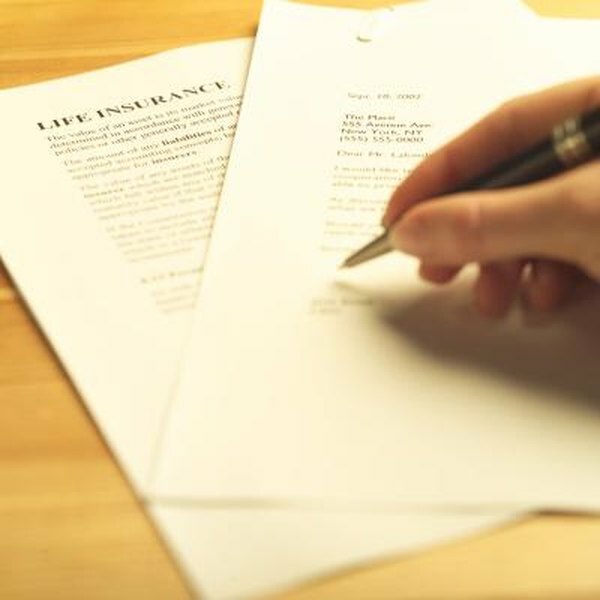 While the specific rate of interest may differ between insurance companies, it is typically around 6 percent per year. While your insurance company may limit the amount you can borrow to a certain percentage -- for example, 90 percent of the policy’s loan value -- most allow you to borrow the full amount. As with any other type of loan, cash value borrowing requires repayment according to a set rate of interest and the total amount you borrow. There are no restrictions on how you can use the money you borrow against cash value. While repayment is ultimately necessary, you do have the option to make interest-only payments at any time over the life of the loan. Understand, however, that any outstanding loan amount will reduce the death benefit your family receives if you pass before repaying the loan in full. If you fail to make even the minimum interest-only payment, your insurance company will add the interest amount to your loan balance, further reducing the death benefit amount. Borrowing against cash value may seem attractive but for a number of reasons it is not always the best option. Consider that cash value loans most often do not come with a repayment schedule. It is up to you to decide whether to make principal-plus-interest payments, interest payments only or no payment at all. While flexible payment options may be appealing, consider the effect this can have on your family if you should pass unexpectedly. Consider also that you will lose the tax benefits you currently enjoy if you fail to make payments on a cash value loan and then let the policy lapse. While loan proceeds come to you tax-free, the IRS will apply income tax to the outstanding amount of the loan plus any interest that accrues if you either surrender the policy or let the policy lapse. Insurelane: What is Cash Value? Bankrate: Can I Borrow From My Life Insurance Policy?